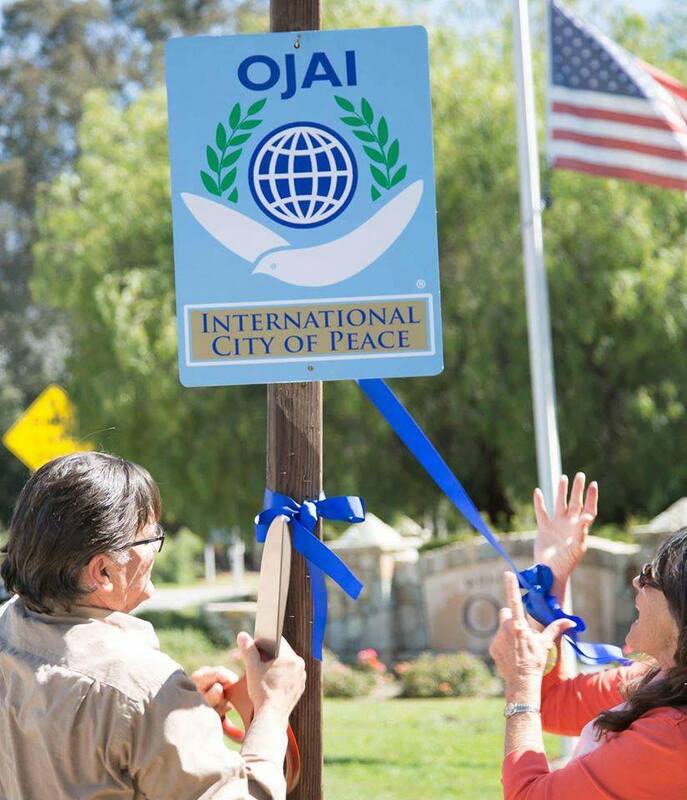 Welcome to Mohamed Jimale Ali and his colleagues who have created a city of peace initiative in the Hodan District of Mogadishu, Somalia. Mohamed is leader of PASOS, a non-governmental, non-profit and non-political organization since 1997, which devoted to humanitarian advocacy, peacemaking, and reconciliation in the conflict areas of Somalia Their areas of work include: Banadir, Galgadud, Gedo, Lower-Juba, Middle Juba, Lower-Shabelle and Bay regions of Somalia. 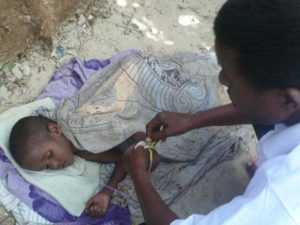 Leader Mohamed Jimale Ali of PASOS, organization that does much needed distribution of food and essentials to the at-risk communities of Somalia. 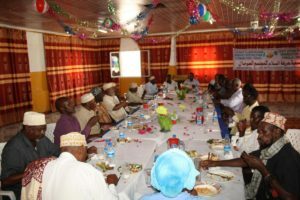 A peace awards dinner in the Hodan District of Mogadishu. unfortunate civil wars there were political interventions. independence traditional and religious leaders used to lead Somali people. Food distribution program of PASEO. It is our honor to extend the greetings of PASEO to all groups who are virtually engaged to serve to the most needed members of our society-displaced, orphans, widows, as well as the refuges both in and outside the country. 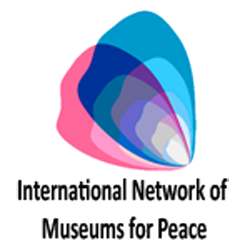 PASOS is a national humanitarian, nongovernmental, non-profit organization. 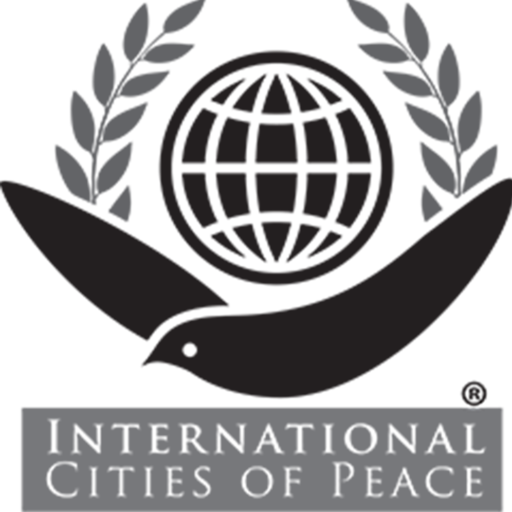 Established by civil society groups on 1st January 1997, the organization is dedicated to advocacy of human rights, democracy, peace and conflict resolution as well as the protection of the rights of the vulnerable members of society. Our vision is for a self-sufficient and sustainable Somalia. To establish free Somalia guided by each other and committed to honoring the gender equity sensitivity and justice for all. We believe our Commitment and your contribution to our efforts will add a new dimension to international efforts and together we are sure we can tackle all our constraints in a responsible manner to the benefit human beings. To empower the vulnerable and the underprivileged communities in Somalia in order to bring about sustainable development and positive social transformation while focusing on equity, justice and human rights. 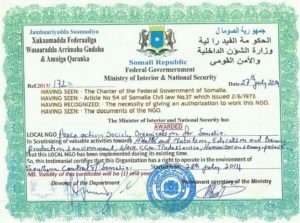 Charter for PASEO from the Ministry of Interior and National Security in Somalia. 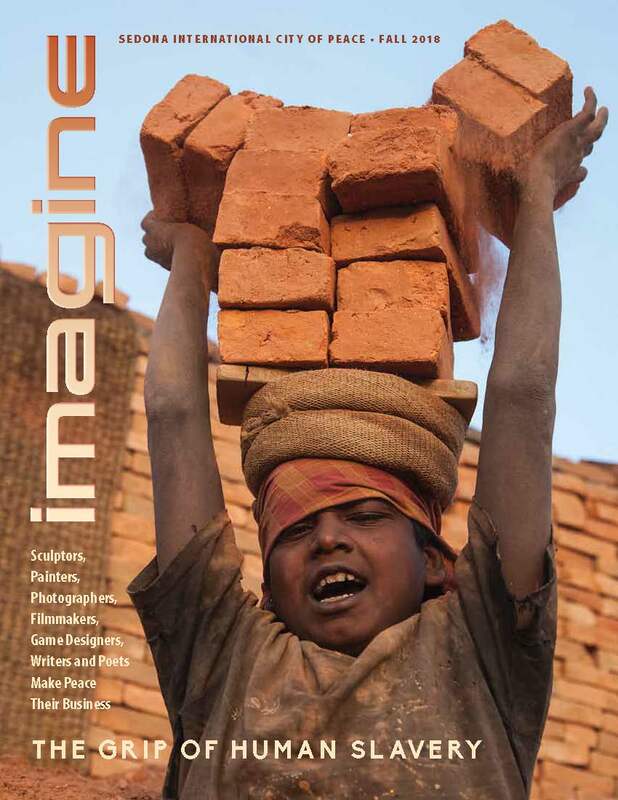 (a) Improve the quality of life for the vulnerable, disadvantaged, and marginalized communities. 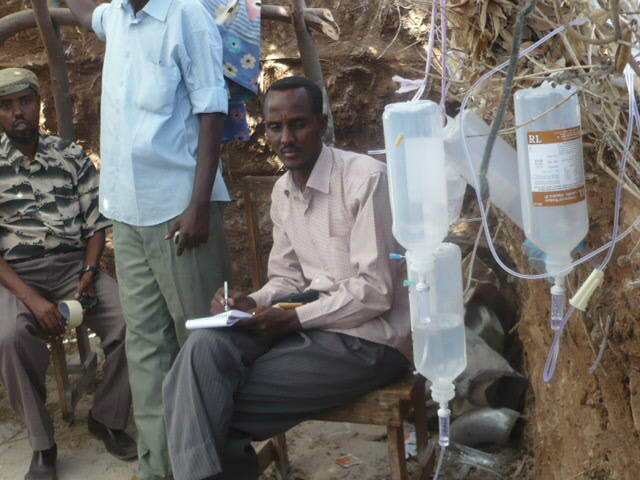 (c) Increase access to safe portable water, sanitation and good hygiene conditions. 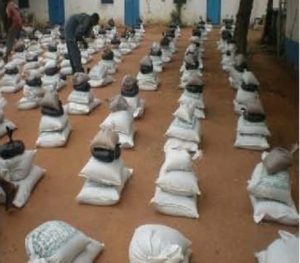 (b) Enhance emergency response and livelihood crisis intervention through provision of food/cash/non-food items relief, Livestock take-off /re-stocking, Water trucking to pastoralists and provision of temporary shelters. (c) Improve access to Water, Sanitation and Hygiene (WASH) conditions of the poor communities through construction and/or rehabilitation of water catchment dams, installing water tanks and construction of underground water tanks, provision of sanitation facilities and hygiene awareness training and promotion hygiene education. (d) Improve access to education by children and youth through provision of facilities, teaching and learning materials. (e) Eradicate harmful cultural practices like Female Genital Mutilation (FGM) and early marriages. (g) Improve health status of communities through health education; environmental cleanliness, hygiene promotion and increasing access to primary health and child care centers in area of operation. Religious and traditional leaders had a power in the community and they also had a dignity in their community and the people used to listen their speech and plans. Every decision comes from the intellectual with the religious leaders had to be respected undisputedly. 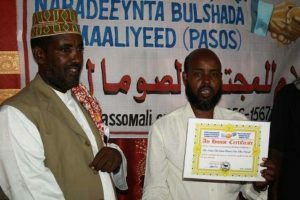 Thus PASOS is one of the originations that work for peace and human rights based in Somali capital Mogadishu. 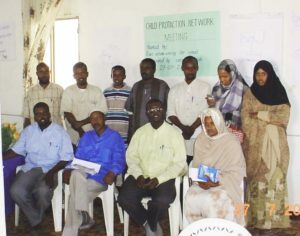 The organization has branches in all Somali regions and plans to mobilize meetings to reinforce peace and tradition. Getting a hand from peace loving people to the organization had engaged traditional leaders, religious leaders, civil society groups, politicians, human rights groups to see the role of peace of Mr. Sultan Ali Sultan Ahmed Nor. 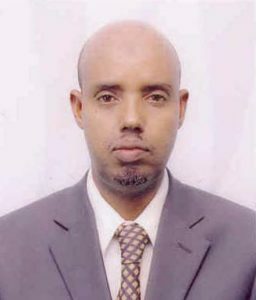 He is the speaker of Somali cultural organization. This gentleman had mediated and solved fighting between two Somali clans in the middle regions. Mr. Sultan himself if from one of these clans in that area. This task took 90 days for Suldan and he had issued strong decision. PASOS presented noble peace prize certificate to Sultan to encourage peace. This gentleman had risked his life during the negotiation and he had signed that the clan he is from will have the aggression. It is something new in the history of Somalia he is the first Sultan of his kind admitted that his clan is wrong. 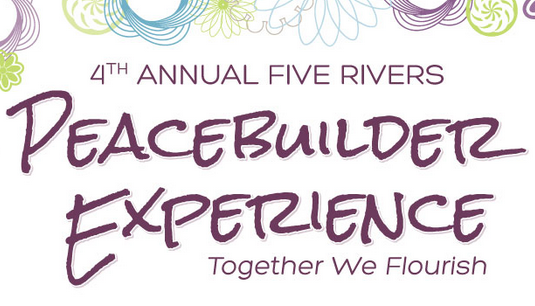 Mohamed Jimale Ali is the liason between PASEO and International Cities of Peace. He is director of the organization. 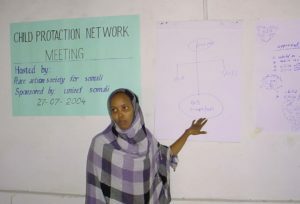 Peace Action Society Organization for Somalia (PASOS) is a professionally managed and committed national Non-Governmental and Non-profit-making organization, founded by civil society groups on 1st January 1997 in Mogadishu, Somalia. The primary focus of PASOS is on the problems of the poor in their struggle to obtain a life of justice and dignity. Environment stabilization, food security and empowerment of the community for self-governance are the most important components of its mission. Gender justice, advocacy on Human Rights, Democracy, peace and Conflict resolution in society child protection and child rights, natural resource management, and livelihood security are our primary areas of concern. Hodan District (Somali: Degmada Hodan) is a district in the southeastern Banaadir region of Somalia. It is a neighborhood in the northwestern part of Mogadishu. Somalia, officially the Federal Republic of Somalia (Somali: Jamhuuriyadda Federaalka Soomaaliya, Arabic: جمهورية الصومال الفدرالية‎ Jumhūrīyat aṣ-Ṣūmāl al-Fidirālīyah), is a country located in the Horn of Africa. It is bordered by Ethiopia to the west, Djibouti to the northwest, the Gulf of Aden to the north, the Indian Ocean to the east, and Kenya to the southwest. Somalia has the longest coastline on the continent’s mainland, and its terrain consists mainly of plateaus, plains and highlands. Climatically, hot conditions prevail year-round, with periodic monsoon winds and irregular rainfall. Mogadishu, Somali, known locally as Xamar (English: Hamar), is the largest and capital city of Somalia. Located in the coastal Banaadir region on the Indian Ocean, the city has served as an important port for centuries. As of 2015, it has a population of 2,120,000 residents. Tradition and old records assert that southern Somalia, including the Mogadishu area, was historically inhabited by hunter-gatherers. These were later joined by Cushitic agro-pastoralists, who would go on to establish local aristocracies. 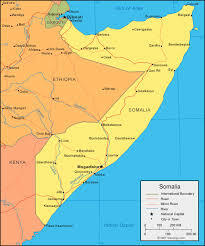 During its medieval Golden Age, Mogadishu was ruled by the Muzaffar dynasty, a vassal of the Ajuran Sultanate. It subsequently fell under the control of an assortment of local Sultanates and polities, most notably the Geledi Sultanate. The city later became the capital of Italian Somaliland (1889-1936) in the colonial period. After the Somali Republic became independent in 1960, Mogadishu became known and promoted as the White Pearl of the Indian Ocean. After the ousting of the Siad Barre regime in 1991 and the ensuing civil war, various militias fought for control of the city, later to be replaced by the Islamic Courts Union in the mid-2000s. The ICU thereafter splintered into more radical groups, notably Al-Shabaab, which fought the Transitional Federal Government (2004-2012) and its AMISOM allies. With a change in administration in late 2010, government troops and their military partners had succeeded in forcing out Al-Shabaab by August 2011. 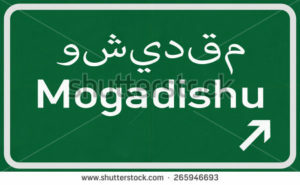 Mogadishu has subsequently experienced a period of intense reconstruction.